First time by the trio on SSR. 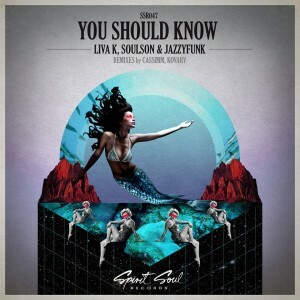 Liva K, SoulSon & JazzyFunk is here. With the lovely vocals of JazzyFunk the track start out slow paced but fast moves into another direction. Some amazing bland of pads, basses and piano in the break make this a really nice warm suiting trip for the cold dark autumn. On the remix side we have first have CASSIMM. You know by now what to expect from him, he gives us his personal touch of swirling bass patterns. Drums and vocals are up to pair with this remix who is better suited for the dancefloor or just chair jumping. Last but not least we have a newcomer Kovary. From the first second he points out the direction, and its funky. Can you hear a cowbell in there ? A wonderful groove is accomplished and a perfect ending to this ep.